Sarah Koenig (/ˈkeɪnɪɡ/; born July 9, 1969 in New York City) is an American journalist, public radio personality, former producer of the television and radio program This American Life, and the host and executive producer of the podcast Serial. Koenig was born July 1969 in New York City to Julian Koenig and his second wife Maria Eckhart.. Sarah is Jewish. Her father was a well known copywriter. After her parents' divorce, Sarah’s mother married writer Peter Matthiessen.. Koenig graduated from the University of Chicago in 1990 with A.B, majoring in Political Science. She attended Columbia University for her postgraduate degree in Russian history but she left after two weeks. After graduating from college Koenig began working as a reporter at The East Hampton Star. Then she worked in Russia as a reporter for ABC News and later for The New York Times. She covered the State House (politics) for the Concord Monitor and later for the Baltimore Sun. She began working as a producer for This American Life in January 2004. She co-produced the 2006 Peabody Award-winning episode of This American Life titled "Habeas Schmabeas." In 2013, she began work on a spinoff podcast of the This American Life radio program titled Serial, which debuted in October 2014. Serial was honored with a Peabody award in April 2015, noting that it took podcasting into the cultural mainstream. TIME magazine named Koenig one of "The 100 Most Influential People" on April 16, 2015. Also in 2015, she was named as one of The Forward 50. Koenig is the daughter of advertising copywriter Julian Koenig and Maria (Eckhart) Matthiessen. Her stepfather was novelist Peter Matthiessen. Koenig attended Concord Academy in Concord, Massachusetts. She lives in State College, Pennsylvania, with her husband, Ben Schreier, an associate professor of English and Jewish studies at Penn State, and their two children. ^ "The Lowell Thomas Award 2005". Overseas Press Club of America. 2005. Retrieved November 5, 2014. ^ a b "OFF OFF Campus | Sarah Koenig". OFF OFF Campus. Retrieved November 5, 2014. ^ a b Sarah Janssen, ed. (December 6, 2016). The World Almanac and Book of Facts 2017. World Almanac. United States: World Almanac. p. 1737. ISBN 978-1-60057-207-4. Retrieved May 3, 2017. ^ "Radio Archive by Contributor | Sarah Koenig". This American Life from WBEZ. 2014. Retrieved November 5, 2014. ^ "SERIAL | About". SERIAL. Chicago Public Media & Ira Glass. 2014. Retrieved November 5, 2014. ^ ""Uncommon Interview: Serial's Sarah Koenig (A.B. '90)"". March 2015. ^ "Non-Cook of the Month – Sarah Koenig". Picky Grouchy Non-Cook. May 2012. Retrieved November 5, 2014. ^ a b "Staff | This American Life". This American Life. Chicago Public Media & Ira Glass. 2014. Retrieved November 5, 2014. ^ "This American Life | Habeas-Schmabeas". This American Life from WBEZ. March 10, 2006. Retrieved November 5, 2014. ^ "Serial". www.peabodyawards.com. 2014. Retrieved January 20, 2016. ^ "The 100 Most Influential People". Time Magazine. April 16, 2015. Retrieved April 16, 2015. ^ "Forward 50 2015 –". Forward.com. November 7, 2015. Retrieved November 11, 2015. ^ "2015 Commencement Note for All Students". Concord Academy. Retrieved May 7, 2018. ^ a b Sellers, Caitlin (February 16, 2009). "Radio show offers glimpse of professors' love story". The Daily Collegian. The Daily Collegian, State College, PA. Retrieved November 5, 2014. 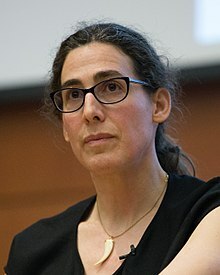 Wikimedia Commons has media related to Sarah Koenig. This page was last edited on 1 April 2019, at 05:41 (UTC).